"This is a very pretty and tasty drink. Great for adults and children." In a saucepan, combine sugar and water. Boil for 1 minute, stirring to dissolve sugar. Remove from heat, and stir in vanilla and red food coloring; allow to cool. Store in a squeeze bottle for easy use. Fill glasses halfway with ice. Add 1 tablespoon syrup, then top with 8 ounces lemon-lime soda. Garnish with a slice of lemon. 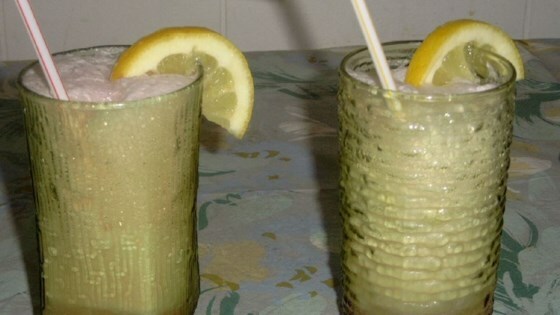 This pretty drink has a great sweet and tangy flavor that my family and I loved. We will be serving it at our daughters wedding! These were so good! Kids loved them!